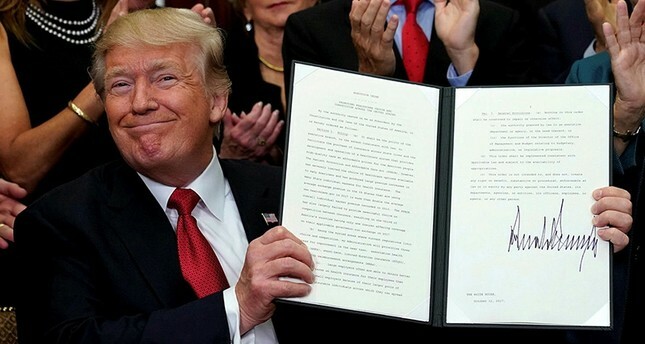 When U.S. President Donald Trump came into office in January 2017, he brandished his pen to make good on a string of campaign promises, including "a total and complete shutdown of Muslims entering the United States." In 2017, Trump signed two executive orders and a presidential proclamation to ban immigrants from certain Muslim-majority countries – Executive Order 13769 on Jan. 27, EO 13780 on March 6 and Presidential Proclamation 9645 on Sept. 24. Altogether, they've been struck down 10 times by courts and brought five times before the Supreme Court. Over 90 legal challenges have been filed against the orders. Despite the well-armed opposition to Trump's so-called Muslim bans, have they still managed to make an impact? A study by Georgetown University's The Bridge Initiative says they have – significantly. The Bridge Initiative found that between 60,000 and 100,000 visas have been revoked since the first order in January 2017. There was a 13 percent decrease in immigrant visas and 20 percent decrease in non-immigrant visas issued to citizens of Muslim-majority countries between March and October 2017. Non-immigrant visas issued to citizens of Arab countries plunged 30 percent in April 2017 compared to the previous year. Non-immigrant visas issued to Iranian nationals fell by half (52 percent) and for citizens of Somalia, that number decreased 68 percent. Non-immigrant visas issued to citizens of countries listed in the March 6 order – including Iran, Libya, Somalia, Sudan, Syria and Yemen – fell by 55 percent. As to be expected, the religious background of refugees entering the U.S. shifted drastically in the first half of 2017. In February, 50 percent of refugees were Muslim and 41 percent were Christian. By June, those percentages had shifted to 31 percent Muslim and 57 percent Christian. By November 2017, less than 10 percent of all refugees resettled in the U.S. were Muslim. Though the countries on the list have changed since the first order, 10 countries in total have been affected since January 2017: Chad, Iraq, Iran, Libya, North Korea, Somalia, Sudan, Syria, Venezuela and Yemen. It's important to note that Chad, Iraq and Sudan were spared Trump's wrath in the third proclamation, and that the scope of the restrictions on nationals from North Korea and Venezuela, both non-Muslim majority countries, differ drastically from others on the list. Trump has certainly made the most of his controversial orders, referencing the ban 34 times on Twitter, 19 times after terror attacks where initial suspect was a Muslim. The Trump administration has defended the bans by pointing to a waiver provision allowing people from targeted countries to seek entry if they meet certain criteria. However, the Georgetown initiative found that out of 8,406 visa waiver applications received in December 2017, only two were approved. A final verdict on the legality of the bans is awaited any day now from the Supreme Court, who heard arguments on the case on April 25. Based on justices' responses, analysts expect the ban will pass.